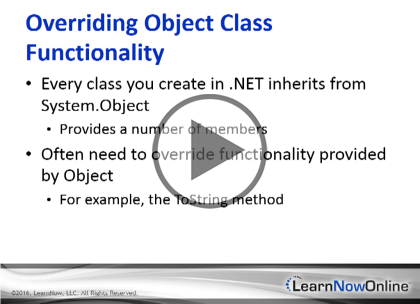 This class teaches you the nuances of objects, which are the building blocks of complex applications. Noted instructor and consultant Don Kiely will teach you what you need to know about value and reference types as well as how to take control of the garbage collection process included in .NET in order to dispose of objects and manage their memory footprint. This course builds upon: Programming C# 6: Getting started Programming C# 6: Your First App Programming C# 6: Projects and Syntax Programming C# 6: Variables and Data Types Programming C# 6: Adv Data Types and Operators Programming C# 6: Strings, File I/O and Date Types Programming C# 6: Conditions and Looping Programming C# 6: Objects and Classes It is considered a more Intermediate to advanced topic after you have gone through these other courses.